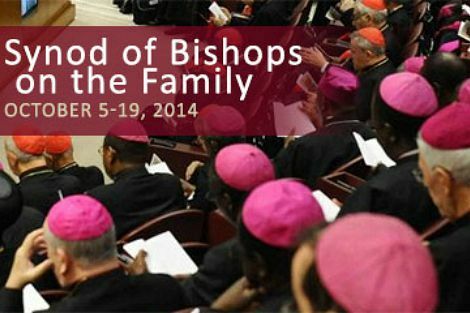 Bishops from around the world will soon be travelling to Rome for next week's Synod on the Family. The media portrayal of the Synod, and the interest of many Australian Catholics, has focused on the conflict between the liberal bishops led by the Pope, and the conservative bishops under Cardinal Burke. The flash points of this conflict are whether divorced and remarried Catholics should be able to receive communion, and whether the Synod should extend an unqualified welcome to Catholics of a homosexual orientation or should accompany it by reiterating forcefully Catholic teaching on homosexuality. The scope of the Synod, however, is much broader, and there are many other significant parties. Bishops of the Third World, for example, are impatient with their First World fellows' narrow focus on divorce and homosexuality. They will want the Synod to focus on the life and death issues that face families in their region. These include acute domestic violence, fathers absent from home seeking work, hunger and shortage of water, and the delicate task of handling religious differences within families. Many will also hope that the Synod will criticise an international economic order that in their region keeps families in poverty and rapes the environment on which they rely. So, although important to respond to generously, divorced and homosexual Catholics will not be the only people who make a claim on the Synod. But they are important, and the divisions between the bishops are real. They are also generally misread by the media. Most commentators divide the parties along these lines: One group takes it for granted that autonomous individuals choose their values, and have the right to live by them without discrimination as long as they do not harm others. Not judging implies approval of the value chosen. This view is commonly held in Western culture, including by many Catholics. It implies that divorced and remarried persons should not be discriminated against by being denied communion, and that homosexual Catholics should not be judged, because homosexuality itself is a legitimate Catholic choice. The opposed group holds that Catholics inherit a faith and moral tradition which is accepted and passed on to the next generation. Although people who do not live by this tradition should be treated courteously, the tradition of the Church relating to homosexuality, divorce and Eucharist should be spelled out firmly and uncompromisingly to an uncomprehending world. The difference between the two parties is often portrayed as one between an authoritarian insistence on allegiance to a normative tradition and an enlightened endorsement of individual moral autonomy. The difficulty with this view is that very few, if any, bishops, and certainly none of the leading figures at the Synod, hold the first view. They all accept that an authoritative tradition of faith and moral living is central to the Catholic Church, and they work within this tradition. So no one should be surprised when Pope Francis endorses the Catholic and papal tradition on this or that point. Nor should his endorsement be seen as paying lip service to the tradition out of a strategic decision to avoid unnecessary conflict. The surprising thing is that anyone should be surprised. The real differences between bishops at the Synod touch on what is central within the tradition and what is open to question, and how the tradition should be embodied in the detail of Catholic practice. Few bishops would hold that the morality of homosexuality or divorce are open questions in Catholic tradition. They would differ, however, on whether the long-standing practice of denying communion to the divorced and remarried is unchangeable, and on the way in which the boundaries of Christian identity are preserved when welcoming people at its margins. These questions touch the life of the community. They are particularly important at the Synod because the way in which they are handled will decide whether Pope Francis' vision of a church defined by its welcome to people at its margins is accepted by the bishops as more than a personal thing or will be subordinated to the firm marking out of boundaries. That is why the issues facing the Third World Catholic Church are so important for the Synod. They remind us all that questions about marriage, sexuality and family are first and foremost about people and their flourishing, and not about the Church. Certainly, questions about poverty and the environment are very important ones for any church synod. This is something both liberal and conservative wings should agree about. Of course, questions about marriage, sexuality and family affect people in both First World and Third World situations. To be discriminated against because of divorce, or homosexuality, affects people deeply and inhibits their capacity to live life fully. Divorce is often not about choice - a woman may be subject to domestic violence and this is the only way to protect herself and her children. Homosexuality may not be perceived as a choice by those with this orientation. It is part of their identity. Until the Church grapples with the nuances of this situation, people will feel alienated from what should be the central institution of their lives. Andrew, thank you for your insight, wisdom and clarity of discourse in addressing this pervasive yet important topic. Will they be inviting you to the Synod? I recently read Yves Congar's journal on Vatican 2. It just strikes me as a pity and a trajedy of epic proportions that the topics discussed 50 years ago (and unresolved then) are still on the agenda: Homosexuality, the place of women in the Church,celibacy,the family. When will our Church finally grasp the nettle and get with it. I sincerely hope they do otherwise the current chronic shortage of priests will be irrelevant. Let's send a message to Rome and the Bishops .Let's address issues of the family from a positive ,inclusive position not a punitive, reactionary one. Will the synod address the serious problems of violence and abuse within families? Domestic violence? Sexual abuse of children by fathers, grandfathers etc.? If we were to have a royal commission about sexual abuse of children in families, I reckon it would run three times as long as the commission enquiring into institutional abuse. I have to say that this phrase "because homosexuality itself is a legitimate Catholic choice" sticks out. Why on earth would anybody choose so much pain? It isn't a choice. I sort of agree with your analysis, but "individuals choose their values" seems not always the case as much as individuals choosing the way they apply values commonly held by nearly everyone. So, it seems to me that the Catholic Church does not apply the value of 'loving the other', at least to people it disapproves of. Homosexuality is not a choice. People are born gay. Does it matter if sexual orientation is a choice or not? If sexual orientation is morally neutral, then why the fanaticism from some people to eliminate all doubt on this issue? Everyone has their own experience with sexual identity and I don't appreciate having to conform my experience to fit into either a religious or ant-religious moral/world view of something that is highly personal to me. Great comment, Margot. Thankyou. Our families take many shapes these days, and include the gay the divorced, people in short-term relationships etc. If we can love and include them all, who could believe that God does less?All accepted, all called, and, on the journey, all being prompted towards any life-changes needed. Sounds simple to me. Margot, I've always understood it that if I'm in a state of mortal sin, I should avail myself of the Sacrament which is always there for me: The Sacrament of Confession. There I would confess my sins and resolve never to commit them again. And I would be allocated a penance and then be absolved. Only then I would thus be in a state to receive Holy Communion, and benefit from its graces. Are you suggesting, contrary to Her teaching, that there is a privileged lot, apart from us rank-and-file sinners, who are excused from this procedure by Holy Mother Church? I am not surprised that comments clearly align with either of the perceived views made by most commentators. Sadly, I will be unsurprised by the surprise that awaits whatever comes out of the synod. In any case, in the Third world, where I come from, hardly anyone is denied communion. But then, not everyone goes to church. Some have to work on Sundays. Or rest. Some of our bishops gratefully have these people in mind. Yes, HH, there is a privileged lot. Read the Beatitudes. Does anyone remember the words of Jesus? "Does anyone remember the words of Jesus?" Sure I do: how about "Go and sin no more"? (John 8:11). But I don't seem to remember a beatitude along the lines of "Blessed are ye who x: you don't have to repent of your sins."